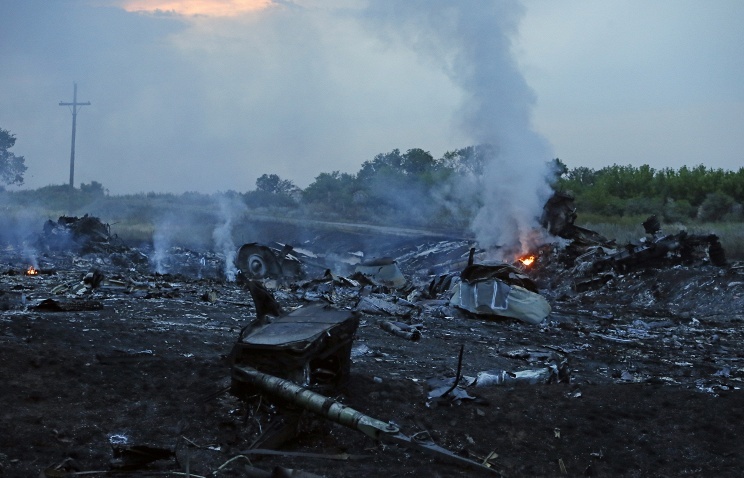 World July 18, 9:34 UTC+4 The Malaysia Airlines Boeing 777 was carrying 298 people aboard, including 15 crewmembers Donetsk self-defence forces promise to ensure access to Malaysian jet crash site KIEV, July 18. /ITAR-TASS/. As many as 121 people were found dead at the crash site of a Malaysian Airlines passenger plane Boeing-777 in east Ukraine’s Donetsk region, the press service of the Ukrainian State Service of Emergency Situations reported on Friday. “As many as 121 people were found dead at the air crash site at 7am local time on July 18. Ninety-five emergency workers and 18 units of machinery are involved in the search-and-rescue operation,” the press service said. Malaysia Airlines Boeing 777 crashed in eastern Ukraine Thursday afternoon while performing a flight from Amsterdam to Kuala Lumpur. There were 298 people aboard, including fifteen crewmembers. Communications with the jet were lost when it was at a distance of some 50 kilometers away from the Ukrainian-Russian border. The airliner took off from Amsterdam at 12:15 Central European Summer Time (10:15 UTC) and was scheduled to land in Kuala Lumpur at 06:10 Malaysia Time on Friday. It was expected to enter Russian airspace at 17:20 Moscow Standard Time (13:20 UTC).